Each year a Brigade of Gurkhas Annual Report is presented to the President of Nepal. Usually, it is presented by the Colonel Commandant or in his absence by the British Ambassador to Nepal. On Friday 12 August 2016, His Excellency Richard Morris, accompanied by the Defence Attaché, Colonel Ian Logan, were granted an audience with the President to deliver the Annual Report. Looking back to 2015 the report covers the excellent work undertaken by the Brigade in celebrating Gurkha 200; two hundred years of loyal service to the Crown celebrated through events around the world. It also highlights how members of the Brigade provided support to Nepal in response to the earthquakes; through immediate presence in Nepal by British Gurkhas Nepal (BGN) assisting with recovery and support, some UK based soldiers were able to deploy at short notice to assist BGN and GWS, QGE squadrons deployed to undertaken reconstruction, and all units undertook extensive fundraising with the total raised reaching £0.5 million. 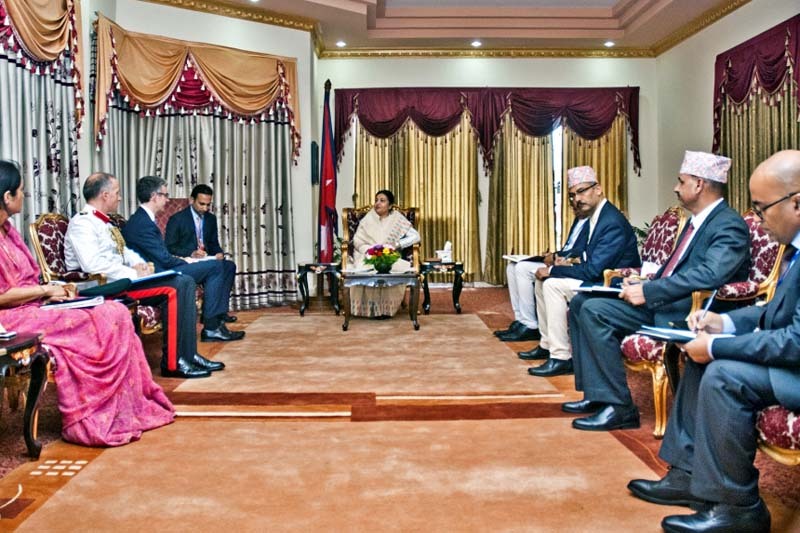 As ambassadors for Nepal, the report also highlighted the excellent professional performance of the Brigade of Gurkhas both militarily and in sporting competitions, as well as the assistance and training provided to the Nepalese Army. All copies of previous reports are included in the annual Kukri magazine. Copies of previous Kukri magazines are available electronically here.